Once you enter your basic business information, you can add a list of your offerings by clicking on Menus Lists or Price Lists in the left-hand toolbar. The choice depends on the category you chose when creating your Profile. If you chose Restaurants as your Primary Category, the toolbar displays Menu Lists. If you chose a service-oriented business, Price Lists displays. Like your other business information, a Menu or Price List is published to all of Get Found's partners, including Google, Bing, Yelp, TripAdvisor, YP, Foursquare, Citysearch, and many other smaller sites. When you change your menu or price list, Get Found automatically sends the new version to those partners. Since 97 percent of consumers search online for products or services in their area, having your menus or price lists appear on multiple websites is critical for attracting new business. Note: Auto imports are no longer available. Click Menus or Price Lists in the left-hand column. If you choose Create Menu/Price List, enter a name for your menu and click Submit. Your new menu displays four choices below its name. 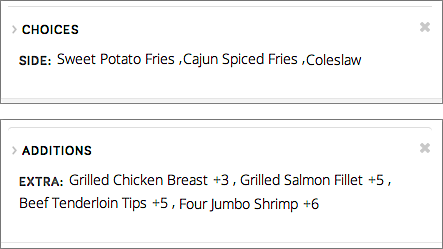 Click New Item or New Section, depending on how you want to organize your menu/price list. Note: After creating your first menu/price list, you can add others simply by clicking Add Menu/Add Price List at the top of the window. Use the Name, Price and Add A Description fields to enter the item or section information. Press Enter/Return to add another item/section or click X to delete an existing item/section. To move an item into a section or rearrange the order of any items, click the left-side triple bar and drag it to a new position. Click More to Add Choices for such things as side dishes or Add Additions for add-ons. 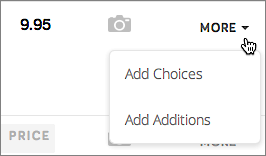 To add a photo to a menu item, click the camera icon next to the menu item, then Upload A Photo and browse to the photo you want to use. Use the resize/crop overlay if the image needs adjustment to fit. Note: The image you choose to upload cannot be larger than 10MB and must be formatted as a .jpeg, .jpg, .bmp or .png file. It will be automatically resized as a thumbnail image. Click Accept to add it to the item in the menu/price list.